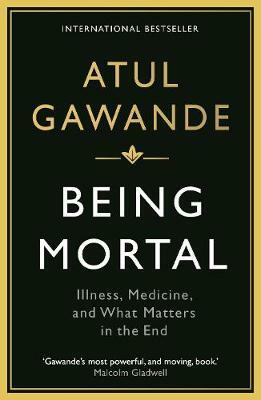 I recently read Being Mortal by Atul Gawande. If you have not yet read this book and are interested in exploring ideas around illness, healthcare and what matters most at the end of life you must make time to read this book. It is thought provoking, insightful and deeply moving. In a world that focuses on the new, the exciting and often the shallow with little thought, time or resource dedicated to the sick, the elderly and the dying, this book allows you to stop and reconsider what is important in life and how we can make better decisions to honour our lives as we age and die. In particular, there is a chapter on hard conversations that really made me reflect on how we talk to patients about research, clinical trial participation and treatment options. As researchers, we play an important role in informing patients about their care options but I had to ask myself…do we truly support them in making the right treatment decision for themselves? With major shifts taking place in medicine and research, are we truly prepared to help patients navigate the decisions around health and mortality? In this chapter, the author discusses a model of the physician-patient relationship. Applying this model to clinical research and the informed consent process made me reflect on how we might use this framework to better support research participants in making decisions about their care and sometimes how wish to live and die. The first type of clinician-patient relationships is the ‘paternalistic relationship’ or the ’doctor knows best model’. 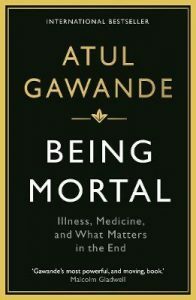 Gawande states that this type of relationship is often observed when patients feel more vulnerable, when they are frail, poor, elderly or with anyone who tends to do what they are told. In my experience, it is often older patients that want a doctor or an authority to tell them what they should do. This paternalistic style is taken when medical authorities (experts) believe they know what is best for patients. The expert has the knowledge and experience. The expert makes the critical choices. The expert tells the patient what he/she believes the patient needs to know. The second is the ‘informational relationship’. In this type of relationship the doctor or expert shares information but then leaves the individual to decide for themselves given ALL the facts. The doctor is the technical expert, the patient is the consumer. The doctor/expert provides the information, meaning the facts and the figures. The job of the patient is to supply a decision. The ‘informative style’ of relationship can work well when the decisions are simple and the trade-offs are straight forward but with this style, the individual also needs to be clear of what they want and what they don’t, but when faced with multiple treatment options including research trials, decisions are not always easy. The third type of relation is called the ‘interpretive relationship’, in this type of relationship the expert shares information but then offers guidance and support to help the individual come to a decision they are happy with. What is most important to the individual? What do they value most in life? In the interpretive relationship there is shared decision making and more information is needed that the facts and figures, there needs to be a greater understanding of the individual. It is this third type of relationship that felt most satisfying to me, knowing what is best for someone means know them as a whole person, it means personalising not only the medicine but the care. The literature supports this idea that patients do not want to be given the information and left alone with it, they need our help to work through the information in order to decide what choice is best for them at that time in their life. Yes this takes more investment and more time, but in my opinion, the satisfaction of this style of relationship allows for more satisfying relationships and more meaningful communication with the people we are trying to help. If you decide to read this book, I do hope you find it as insightful as I did…it definitely made me look at the bigger picture of how people need to be informed and supported when making decisions about their health and their lives. It allowed me to reflect on the importance of our role when introducing research options on top of care and treatments options and that taking the time to get to know the person in front of us, could make a big difference in how someone gets to choose to live their life. Journal of the American Medical Association 267 (1992): 2221-26.